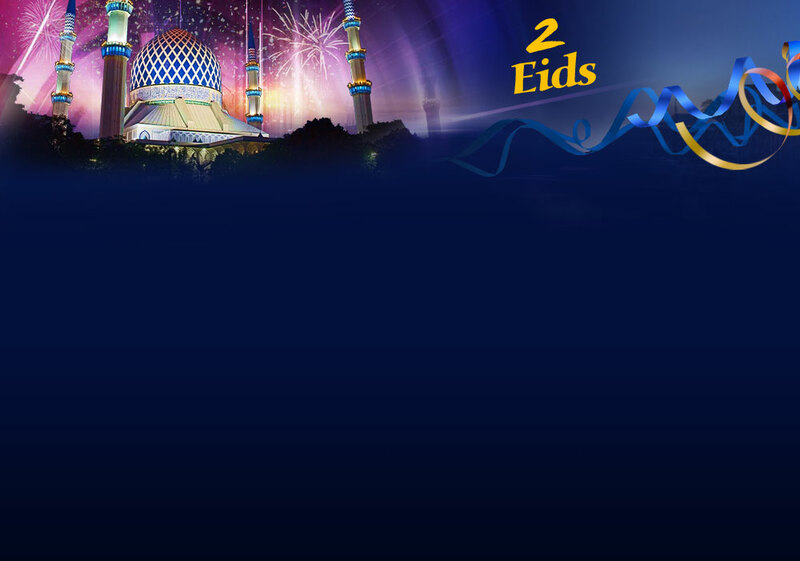 2 Eids - What To Do In Eid? "`Abdullah Bin `Umar (may Allah be pleased with him) used to take ghusl (bath) on the day of Fitr before proceeding to the musalla (prayer place)." "There are three sunnahs for Fitr: walking to the musalla, eating before you go, and performing ghusl." "It is recommended to perform ghusl for Eid. Ibn `Umar would perform ghusl on the day of Fitr; and `Ali is reported to have done so as well. This is also the opinion of `Alqamah, `Urwah, `Ata', an-Nakh`i, ash-Shi`bi, Qatadah, Abu az-Zinad, Malik, ash-Shafi`i, and Ibnul-Munthir." The reports regarding Allah's Messenger (peace be upon him) performing ghusl for the Eid or commanding people to perform it are all weak. "`Umar (may Allah be pleased with him) saw a silk cloak in the market; he took it to Allah's Messenger (peace be upon him), and said, 'O Allah's Messenger, buy this and adorn yourself with it during the Eid and when the delegations visit you.' Allah's Messenger (peace be upon him) replied, This dress is for those who have no good share (in the Hereafter). After a period of time, Allah's Messenger (peace be upon him) sent a cloak of silk brocade to Umar. Umar came to Allah's Messenger (peace be upon him) with the cloak and said, 'Allah's Messenger! You said that this dress was for those who had no good share (in the Hereafter), yet you sent it me!' Allah's Messenger (peace be upon him) said, (I sent it to you) so that you may sell it or use it to fulfill your need. " "The evidence derived from this Hadith is that the Prophet (peace be upon him) has approved of Umar's suggestion to beautify oneself for Eids, and only objected to wearing that kind of garment, because it was made of silk." "This Hadith proves that dressing up for the Eid days was an acceptable custom among the companions, and that the Prophet (peace be upon him) did not object to it, from which it is concluded that it was approved." "This indicates that beautifying oneself on these occasions was common among them. Malik said, 'I heard the people of knowledge express the desirability of perfume and beautification for every Eid.'" "The Prophet (peace be upon him) would wear his best clothes to go to the Eid prayer. He had a cloak that he wore specifically on the two Eids and Friday. Sometimes he wore green cloaks, other times he wore a lined red cloak - not solid red as some people think, but it had red lines like the Yemenite lined cloaks." "Ibn Abu ad-Dunya and al-Bayhaqi reported, with an authentic chain of narrators, that Ibn `Umar (may Allah be pleased with him) would wear his best clothes on the two Eids." Of the beautification for the Eid (for men) is wearing kuhl, perfumes, and oils, and wearing an `amamah (turban) or a kufiyyah (simple cap). As is noted by ash-Sheikh al-Albani in Tamamul-Minnah, the Muslim men should not have their head uncovered, as is customary of the Europeans. "Allah's Messenger (peace be upon him) would not leave (his house) on the day of Fir until he ate some dates." "The wisdom in eating before the prayer is to circumvent the assumption that one must continue to fast until the Eid prayer is over." "The Prophet (peace be upon him) would not leave (his house) on the day of Fir until he ate. On the day of Nahr (slaughtering) he would not eat until he returned - so that he would eat from his sacrifice." "The wisdom in delaying eating on the day of Adha (sacrifice) is that it is a day on which it is legislated to offer sacrifices and to eat from them. Thus, it is recommended for one to eat from his sacrifice on breakfast. This was mentioned by Ibn Qudamah." "The time that the Prophet (peace be upon him) ate his breakfast on each of the two Eids occurred at the proper time of giving out their related sadaqah (charity), thus dispensing of the Fitr charity before going to the musalla, and dispensing of the sacrifice's charity after slaughtering it." It must be noted here that, nowadays, people no longer slaughter their sacrifices at the musalla. They do that at distant places, and sometimes do not get the meat until the evening or the following days. In this case, it is understandable that the sunnah of eating breakfast from the sacrifice's meat cannot be reasonably fulfilled. "The Prophet (peace be upon him) used to go on the day of Fitr and the day of Adha to the musalla; and the first thing he did when he reached there was perform the prayer." One prayer in this masjid (mosque) of mine is better than a thousand prayers in any other masjid - except for al-Masjidul-Haram (the Sacred Mosque of Makkah). Yet, and despite this great merit, he (peace be upon him) left it and went out (to the musalla) (on the days of Eid)." "The sunnah is to hold the Eid prayer in the musalla. `Ali (may Allah be pleased with him) commanded with that; and al-Awza`i recommended it - as did the people of reason; it is also the opinion of Ibnul-Munthir." As for the one who is incapable to go out to pray in the musalla, because of a weakness or old age, then he may pray in the masjid, and there is no blame on him - insha'Allah. It should be noted here that the goal of holding the Eid prayer in the musalla is to gather the largest possible number of Muslims in one place. However, we see in many counties today the establishment of many musallas, even without a need for them. The scholars have warned people against such a thing. And these numerous musallas have been turned into podiums set up to declare loyalty to different parties and divide the word of Muslims. Indeed, there is no might or power except from Allah. "The Prophet (peace be upon him) would take different routes on the day of the Eid." (and the best opinion of all:) for all of these reasons, in addition to other aspects of wisdom that are always associated with his (peace be upon him) actions." "Even if the reason were not known, it would still be absolutely recommended to follow his example; and Allah knows best." "It is recommended for the people, as soon as they complete the Subh (morning) prayer, to head toward the musalla and sit in their places there, saying the Takbirs. As for the Imam, he should arrive just at the time of the prayer." "It is of the Sunnah that you go to the Eid walking." Takbir (saying 'Allahu Akbar' - Allah is the Greatest) is a clearly distinctive feature of Muslims' Eid celebrations. And that you must exclaim Allah's greatness, for having guided you, so that you may be grateful. "... Would leave (his house), on the day of Fitr, saying Takbir until he reached the musalla, and until he performed the prayer. Once he had performed the prayer, he would stop saying the Takbir." "This Hadith provides evidence for the Muslims' common practice of saying the Takbir aloud on route to the musalla, even though many people are now neglecting this sunnah - so that it is almost totally forgotten! It would be useful at this point to remind that saying the Takbir in unison, as many people do, is not permissible. This applies as well to any other form of dhikr (mentioning Allah), whether it is supposed to be said loudly or secretly. Let this be a warning for us, and let us keep in our minds that the best guidance is that of Muhammad (peace be upon him)." "Praise be to Allah. The most correct opinion, which agrees with the majority of the Salaf and scholars among the sahabah and Imams, is that Takbir extends from fajr (dawn) on the day of `Arafah to the last day of Tashriq; it is done following each prayer; and it is recommended for everyone to raise his voice with the Takbir when heading to the Eid. This is agreed upon among the Four Imams." "... And `Umar (may Allah be pleased with him) used to say the Takbir in his tent at Mina, so the people in the masjid heard him, and they also said the Takbir; and then the people of the market places also said the Takbir, until Mina echoed with everyone's Takbir. And Ibn `Umar (may Allah be pleased with them) used to say the Takbir at Mina on these day: after the prayers, on his bed, in his tent, in his sittings, and while walking - throughout these days. And Maymunah (may Allah be pleased with her) used to say the Takbir on the day of Nahr; also, the women would say the Takbir behind Abban Bin `Uthman and `Umar Bin `Abdul-`Aziz on the night of Tashriq with the men in the masjid." "When Ibn `Umar, went out (of his house) on the morning of the day of Fitr and the day of Adha, he would say the Takbir aloud until he reached the musalla, then he would say it until the Imam arrived (for the prayer)." "Allahu akbar, Allahu akbar, la ilaha illal-Lah; Allahu akbar, Allahu akbar, wa lillahil-hamd." "Allahu akbar Allahu akbar, Allahu akbar, wa lillaahil-hamd, Allahu akbaru wa ajall, Allahu akbaru `ala ma hadana." "Allahu akbar, Allahu akbar, Allahu akbaru kabira." "Some additions to the Takbir have been innovated in these times - for which there is no basis." Takbir is a statement that the Muslims are instructed to proclaim frequently, especially in certain situations that may insinuate feelings of arrogance in the heart. When a person slaughters an animal, he may feel arrogant because he has the power to kill. But when he says, "Bismillah, Allahu Akbar - in the Name of Allah; Allah is the Greatest", he remembers his true position, and that, no matter how great and mighty he thinks himself, Allah is greater and mightier, and He is the one who provided him with the animal and gave him the ability to slaughter it. Throwing the stones in Mina is an action of power and aggression. But when the pilgrim says, "Allahu Akbar", he remembers Allah's power and might. In their travels, the Prophet (peace be upon him) and his companions (may Allah be pleased with them) used to say "Allahu Akbar" when they ascended a hill. Rising to a high place is another act that may cause arrogance in the heart. By applying this sunnah, one controls himself and remembers that Allah is greater and higher. Likewise, celebrations are occasions of rejoice and happiness. People tend then to be arrogant. But when they remember Allah's greatness so very frequently, they retain their position of submission and servitude before Him. Furthermore, saying the Takbir loudly and frequently makes people remember that the Eid is a gift granted by Allah , that He is greater than worries and fears which could mar the Eid spirit, that He is the One who guided them, and who is capable of protecting them, removing their worries, and accepting their acts of worship that preceded the Eids. "Allah's Messenger (peace be upon him) entered (my house) when I had two little girls singing the songs of Bu`ath and beating on a duff; so he lay down on the bed and turned his face away. Then Abu Bakr came in and scolded me saying, 'The flutes of Shaytan (the Devil) played in the presence of Allah's Messenger?' So Allah's Messenger (peace be upon him) turned toward him and said, Leave them alone, O Abu Bakr! Every people have an Eid, and this is our Eid." "Bu`ath is a famous battle of the Arabs, in which there was a great victory for the Aws over the Khazraj. The war between the two tribes went on for one hundred and twenty years - until Islam came. The two girls were singing poetry that described fighting and courage, the mention of which is supportive to the Deen. But as for songs that involve mentioning sins, announcing prohibited matters, and displaying evil deeds - it is all prohibited. And it is impossible that anything like that would ever take place in the Prophet's (peace be upon him) presence without him objecting adamantly to it. And as for his saying this is our Eid, it provides the reason for displaying joy in the two Eids as being a symbol of the Deen, because they are different from other days." The Prophet (peace be upon him) did not object to Abu Bakr's statement that the duff, being a musical instrument, is a flute of Shaytan. This is taken as an approval from him (peace be upon him) of this general rule, which conforms with other authentic evidence prohibiting the use of musical instruments. He (peace be upon him) modified Abu Bakr's (may Allah be pleased with him) understanding by indicating that there is an exception to this general rule on specific occasions. The evidence for the third kind is the Hadith about the woman who came to Allah's Messenger (peace be upon him) and said, "O Allah's Messenger, I have made a vow, if Allah brought you back safe, to beat the duff over your head." Allah's Messenger (peace be upon him) sat down and said, Fulfill your vow! On these occasions, hearing the beating of duff is permitted for men, for Allah's Messenger (peace be upon him) did so and approved of it, as is seen in the above Hadith. However, it is not permissible for men to listen to women's singing, because this is an unjustifiable source of great fitnah. The Prophet's (peace be upon him) listening to two little girls does not constitute an evidence in this regard. Because of the general texts prohibiting the use of musical instruments in general, the only musical instrument that the women are permitted to use is the duff; deriving any analogy from this to other instruments is wrong, and is in clear violation of simple principles of fiqh and reason. This privilege of using the duff is not granted to men on any occasion - as will be discussed below. The permission given to sing during the Eids applies only to acceptable poetry that encourages good deeds and behavior. It cannot be extended to the songs calling to sins and disobedience, as is common in many cultures (see the earlier citation from al-Baghawi). Clapping the hands is for women; and raising the voice with tasbih is for men. Allah curses those men who imitate women, and those women who imitate men. And singing and beating the duff are of the acts typical of women. Because of this, the righteous Salaf labeled the man who did that, effeminate." "As for beating it (the duff) for men, it is makruh in all situations. It was only done by women; and if men do it, they would be imitating the women; and the Prophet (peace be upon him) has cursed those men who imitate the women." "It is obvious that his words mean its prohibition (for men)." "The Hadith that says, 'Announce (masculine plural command) the weddings and beat (masculine plural command) the duff for it,' is used by some people as evidence that beating the duff is not specific to women. However, this Hadith is unauthentic; and the authentic Hadiths (in this regard) give that permission to do that for women. Men cannot be included in that because of the general prohibition for men to imitate them." "The fuqaha' (scholars) have said that the duff is that which has no bells, as Ibn al-Hammam mentioned... Likewise, the permissible singing during weddings is specific to women; it is not allowed for men." "... Nothing is excluded from that prohibition of musical instruments, except beating the duff for the young girls - during Eid days, at the arrival of a respected individual from travel, and during weddings - as has been indicated in the Hadiths, and as has been established in various places. And permitting that in some situations does not lead to permitting it in all situations." Common in our times are the ugly scenes prophesied by Allah's Messenger (peace be upon him) in which men and women gather to entertain themselves with musical instruments and other prohibited acts. May Allah guide the Muslims to what is good for them in both lives. "As for people greeting each other after the id prayer by, 'Taqabbalal-Lahu minna wa minkum (may Allah accept from us and you),' or, 'May Allah bring the id back to you next year,' etc. - it has been reported that some of the Sahabah practiced it, and the scholars permitted it. However, Ahmad said, 'I do not initiate saying it to anyone; but if one says it to me, I answer him. This is because responding to a greeting is obligatory, but to initiate the greeting is not a required sunnah, neither is it prohibited; whoever does it would have an example (from the Salaf), and whoever does not would have a predecessor as well.'" "When the companions of Allah's Messenger (Peace be upon him) met on the day of Eid, they would say to each other, 'Taqabbalal-Lahu minna wa mink (May Allah accept from us and you.)' "
"I was with Abu Umamah al-Bahili (Peace be upon him) and some other companions of the Prophet (Peace be upon him). When they returned from the Eid, they said to each other, 'Taqabbalal-Lahu minna wa mink.' "